Cross Country - Hopefully you are enjoying the cooling weather and great fall foliage as you train for your upcoming races. This is a great time of the year to run a personal best in the marathon, half marathon, 10km, or 5km. Good luck in your upcoming races. Hopefully you are enjoying the cooling weather and great fall foliage as you train for your upcoming races. This is a great time of the year to run a personal best in the marathon, half marathon, 10km, or 5km. Good luck in your upcoming races. Also, good luck to all of the college and high school cross country runners as they get ready for their League Championships and post season competition. If you are reading RUNOHIO, you are most likely someone who is interested in running, but you may not understand that cross-country is a great sport. It doesn’t always get the attention that it truly deserves, and, at times, those who are passionate about it don’t communicate how special this sport really is. Mark your race calendar to run or volunteer for the 31st Circleville Classic 5 Miler - Saturday October 20th (held on the Saturday of the Circleville Pumpkin Show). Race starts and finishes at the Circleville High School. Proceeds benefit the Jeff McGowan and Jean McGowan Memorial Scholarship. The 90th boys and 41st girls Ohio High School Athletic Association State Cross Country Championships will be held November 3rd at Hebron’s National Trail Raceway. There are three boys and three girls Championship races contested each year with 96 teams and over 950 athletes competing and over 10,000 spectators to watch these high school athletes compete. Registration for the Arnold 5K is now open – Registration for the 2018 Arnold 5K Pump and Run start November 1st. It is often said that running is an individual sport and to a great extent running is a very personal and individual sport. However, even though an individual trains and races, there are usually many others behind the scenes that lend a helping hand. The Sugar Debate: Is Sugar Evil or OK for Runners? If you are like many runners, you are confused about the role of sugar in your daily sports diet. The anti-sugar media reports sugar is health-erosive, yet sports nutrition researchers claim sugar is performance enhancing. That might leave you wondering: Should I eat sugar or avoid it? Matt McGowan, a 31 year old full time business teacher/department chairman and coach at Bishop Watterson High School in Columbus has had a lifelong interest in running. Matt first got involved with running in grade school in Wheeling, Illinois. In junior high, Matt ran the dashes. However, after his oldest brother, Bill, broke the Circleville High School 880 yard run record, Matt was moved up to that event. Looking for a Race to Run in October? How Do You Want to Keep Up With the Running News? Circleville City Schools recognized and thanked the McGowan family for their generous donation to the track facilities at the CHS Track Invitational last month. In honor of their continued support, the facility will now be known as The McGowan Family Track. Running News from around the world. If you are a race director or a member of a running club - sign up for a one year subscription to the print RUNOHIO for only $8. To take advantage of Race Directors and Running Club Special. RUNOHIO has numerous ways for you to keep up with all of the running in and around Ohio as well as surrounding States. The print RUNOHIO has been providing you with running coverage for over 30 years in Ohio, West Virginia, northern Kentucky, eastern Indiana, western Pennsylvania and southern Michigan. The RUNOHIO web site - http://www.runohio.com has been working with The Running Network and the Fortius Media Group - for over 19 years in providing you National and local running news. 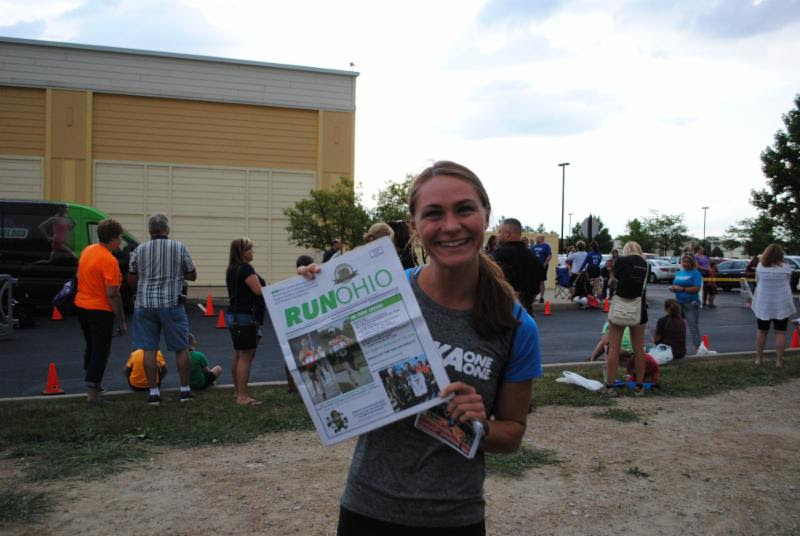 Also, keep up with running in and around Ohio with the RUNOHIO E-Newsletter and Facebook.